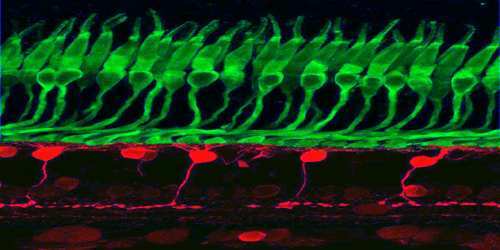 Retina bipolar cells are the first ‘projection neurons’ of the vertebrate visual system. As a part of the retina, bipolar cells exist between photoreceptors (rod cells and cone cells) and ganglion cells. It consists of multiple (9–12) subtypes that differ in their morphology, synaptic connectivity, and response properties. 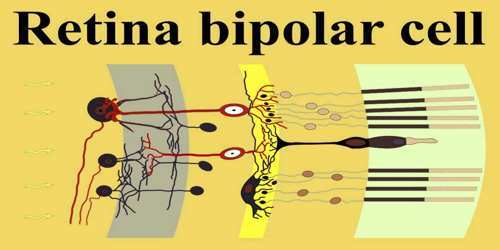 Different types of bipolar cells process different visual modalities in parallel pathways. Bipolar cells are so-named as they have a central body from which two sets of processes arise. They can synapse with either rods or cones, and they also accept synapses from horizontal cells. The bipolar cells then transmit the signals from the photoreceptors or the horizontal cells, and pass it on to the ganglion cells directly or indirectly (via amacrine cells). Unlike most neurons, bipolar cells communicate via graded potentials, rather than action potentials. Dermatology, an elongated, wavy, slender melanocyte filled with fine melanin granules, and long branching dendritic processes, grouped in irregular bundles, often located in the superficial dermis, characteristic of common blue nevus. Haematology, a primitive or ‘early’ cell in the BM that has not terminally differentiated, and is thus capable of giving rise to erythroid and megakaryocytic daughter cells, depending on the type of local cytokines. Neurohistology, a neuron with 2 processes leaving the cell body in opposite directions, e.g., in the vestibular and cochlear ganglia, and in the retina. Neuropathology, an elongation in a well-differentiated malignant cell, which may be a feature dictated by the pre-existing fibers; BCs occur in pilocytic astrocytomas/bipolar spongioblastomas, a primarily pediatric tumour of the third ventricle and cerebellum; in adults, these tumours most commonly affect the temporal lobe. 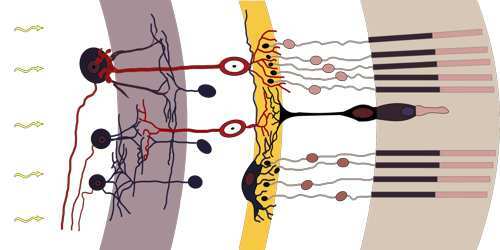 Ophthalmology, the neurons in the retina that receive input from the receptor cells rods and cones and synapse with ganglion cells to form the optic nerve. Bipolar cell output signals represent elementary ‘building blocks’ from which the microcircuits of the inner retina derive a feature-oriented description of the visual world. The mechanism for producing the center of a bipolar cell’s receptive field is well known: direct innervation of the photoreceptor cell above it, either through a metabotropic (ON) or ionotropic (OFF) receptor. However, the mechanism for producing the monochromatic surround of the same receptive field is under investigation. While it is known that an important cell in the process is the horizontal cell, the exact sequence of receptors and molecules is unknown.